Ketchup (or do you say catsup) is one condiment that I initially found it extremely difficult to live without after being put on a low-salt, low-fat, low-sugar diet following my angioplasty in 2012. Regular varieties are high in salt and sugar. But I’ve since found several alternatives and thought I’d post a product comparison here, much in the spirit of my low-salt teriyaki sauce review last September. 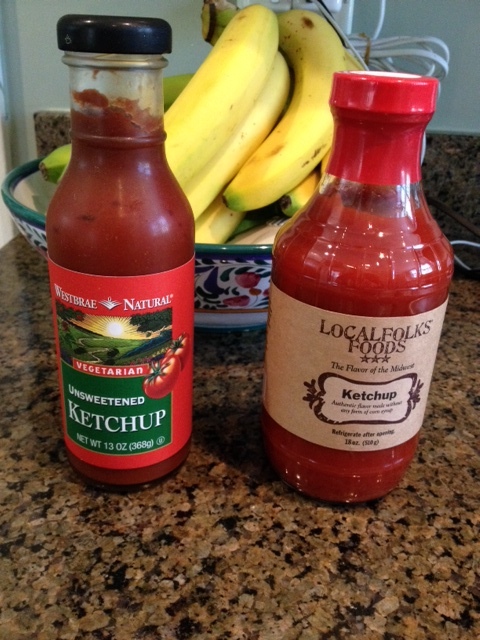 I’ve found two brands of low-sodium,low-sugar ketchup, Westbrae and LocalFolks Foods. The first brand, Westbrae unsweetened, vegetarian ketchup, I found online and subsequently at Whole Foods and Sunset Foods in the northern suburbs of Chicago. A tablespoon of it has 70 mgs of sodium and less than 1 gram of sugar. Recently I discovered a second alternative as well, LocalFolks Foods ketshup, that has only 25 mgs of sodium and 2 grams of sugar in half an ounce, which a quick search revealed to me is the same as a tablespoon. While it’s a bit more sugar, that added sweetness gives it a more traditional ketchup taste. The LocalFolks variety cost $4.34 on sale at Whole Foods (24 cents an ounce) and $4.99 at a local Mariano’s (28 cents an ounce), for its standard 18-ounce bottle. The Westbrae comes in a 13 ounce bottle and sells for around $3.79 a bottle (29 cents an ounce). I’ve written about how I enjoyed LocalFolks barbecue sauces which are also low-salt, low-sugar. A third alternative is to turn to traditional ketchup king Heinz which makes a low-sugar variety and a no salt variety. The no-salt variety has 5 mgs of salt and 4 grams of sugar per tablespoon. As a point of comparison, traditional Heinz ketchup has 190 mgs of sodium per tablespoon, so if you use 6 tablespoons in a day you would be taking in your day’s sodium plus 24 grams of sugar. That’s a good reason to switch to a low-salt alternative. Thanks for sharing low salt ketchup alternatives. I have enjoyed reading!